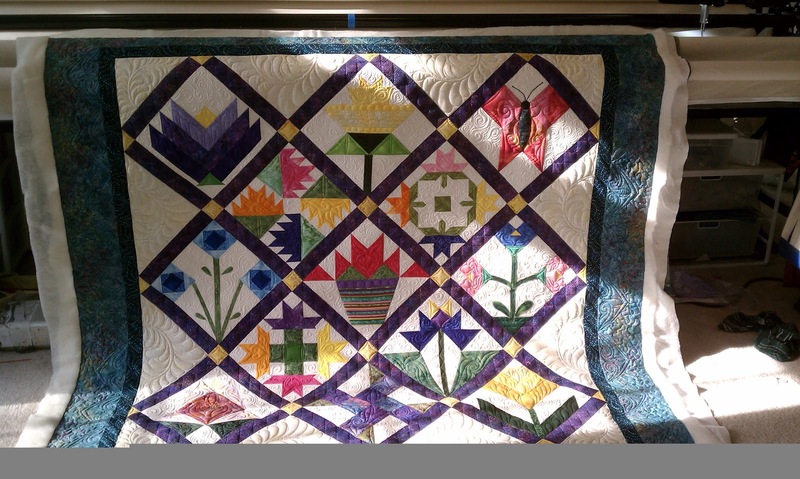 When Kathy showed this quilt at our Bee meeting, I really wanted to get my hands on it. 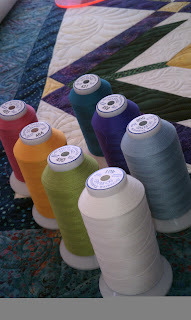 The blocks were done at Bernina World of Sewing's Saturday Sampler. 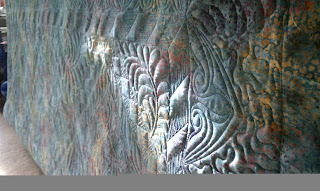 Before I show you the front of the quilt, here is a picture of the back. I laugh when people say that if you put a busy print on the back you will not see the quilting. That is not really true. 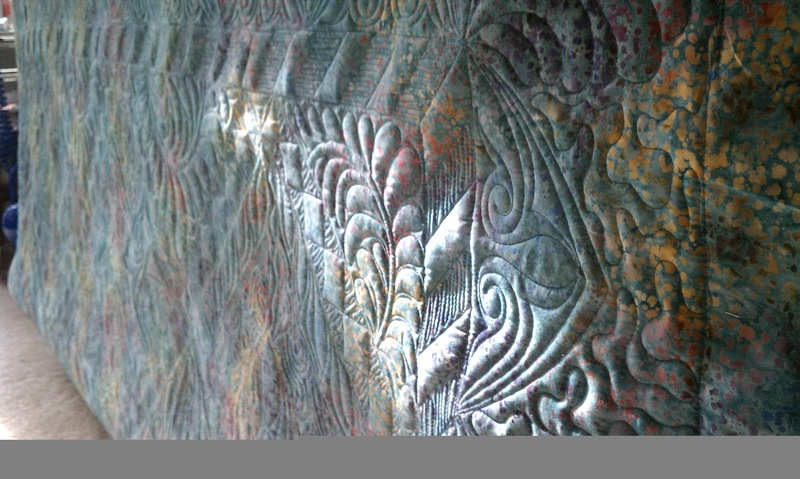 true, it is easier for me to hide my starts and stops, but even on this busy batik, you can still see the quilting. And you can see it from quite a distance. Granted this is partial due to the double batting, but when quilting at this density you can usually see it on the back even without double batting. 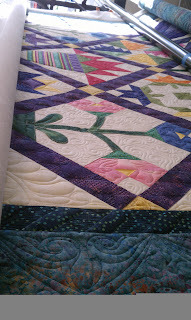 I used Quilter's Dream, Dream Cotton Select on the bottom and Hobb's Tuscany Wool on the top. I love the stitch definition that you get with Wool batting. Kathy had told me that she wanted to use this on a wall so I knew I could get away with double batting and dense fills. I used 7 colors of So Fine! thread by Superior Threads on the top of this quilt. I LOVE So Fine! It is a 50wt. thread so it is thin enough that I can use it when I have to back track without looking thready. Plus it hardly ever breaks and it easy to get my tension just were I want it. I also love that it has a cotton look to it. On the bottom I used some bobbins that I wound, and other were Superbobs prewounds. I may have even used some of the So Fine! prewounds. Since I had the wool in this quilt I used dense fills to make designs in both the inner board and the sashing. I love how the wool puffs the areas that are not densely filled. 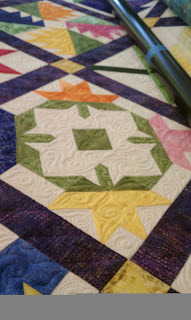 It really does make the quilting pop. This quilt just makes me HAPPY! Thanks to Kathy for entrusting me with her quilt. 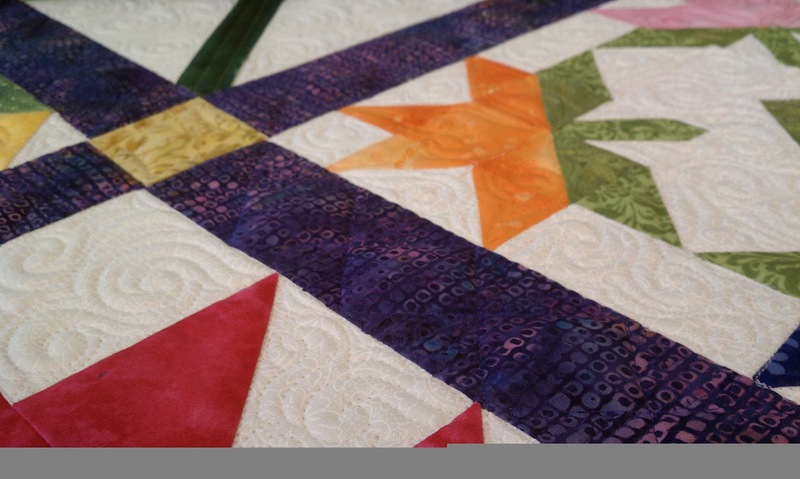 This quilt is sure to always be on my list of favorites!